This note describes the application of the AFM-IR technique to visualize and compare the variable lipid content of stratum corneum at high spatial resolution. Surface features are linked to the underlying chemical characteristics with AFM-IR spectra and IR images. Local concentration of lipids relative to that of the proteins is apparent by observing the change in the band ratio between the methylene C-H (2800 – 3000 cm-1) and the amide-A (3290 cm-1) stretching bands. In addition, localized regions of lipids (1732 cm-1) can be readily differentiated from proteins (1650 cm-1) in respective AFM-IR images. mage: IR chemical contrast image (2930/3290 cm-1) of stratum corneum, showing differences in lipid concentration throughout the sample. Infrared (IR) spectroscopy is one of the most recognized analytical measurement techniques in academic, government, and industrial R&D laboratories for the characterization of polymeric materials. The spatial resolution of conventional bulk IR spectroscopy is limited by Abbe diffraction laws to between 3 – 10 μm, depending on the method used. Atomic Force Microscopy (AFM) is a widely used nanoscale imaging technique that provides the user with a high spatial resolution topographic map of a sample surface. In this note, we will discuss the use of AFM-IR to address nanoscale chemical characterization of the stratum corneum. The stratum corneum (SC) is the outermost layer of skin that serves as a barrier to foreign substances and maintains the homeostasis of the human body, critical in preserving an individual’s well-being. SC consists of a brick-and-mortar structure of corneocytes and lipids that is generated from the underlying skin layers1. This is due in part to the natural shedding and regeneration of the epidermis. Relative to the rest of the skin structure, SC is considered to be the most rigid, with its lipid and moisture content fluctuating based on the external environment. While a great deal of research has been devoted to the chemical understanding of stratum corneum, the diffraction-limited resolution of existing infrared (IR) microspectroscopy halts the observation of structures smaller than 3 – 10 μm. In this application note, we examine the lipid distribution within a specimen of SC at substantially higher spatial resolution than is possible with conventional Fourier transform infrared (FTIR) microscopy using AFM-IR spectroscopy. SC was obtained from a subject’s skin surface using a Kapton tape strip, and then transferred directly onto a ZnSe prism. The clusters of SC cells remained adhered to the prism surface after tape removal were imaged via AFM (Fig. 1A). While the SC sample looks nondescript topographically, chemically distinct structures can be elucidated by AFM-IR™. In addition to the amide-I and amide-II bands, the medium-strong signal at 1732 cm-1 is seen near the center of this sample of SC (red curve, Fig. 1B), implying a larger concentration of lipids. On the periphery, the SC would have a lower lipid content, suggested by the weaker 1732 cm-1 signals. 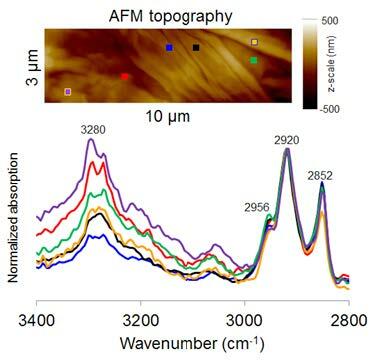 The high lipid content in SC is seen readily from local AFM-IR™ spectra (Fig. 2). The methylene antisymmetric and symmetric stretching absorptions near 2920 and 2852 cm-1, respectively, suggests the presence of long-chain aliphatic materials (lipids). The band height ratio between 2920 cm-1 and 3290 cm-1 is observed to vary depending on the location. Here, the weaker band at 3290 cm-1 (blue curve, Fig. 5) suggests a lower total protein content relative to the hydrophobic lipid-like components. These results agree favorably with published literature on pigskin2. Nanoscale IR imaging via AFM-IR provides an insightful visualization of SC chemical composition. As expected, the strong amide I absorption at 1650 cm-1 is observed at nearly every point of measurement within the sample. 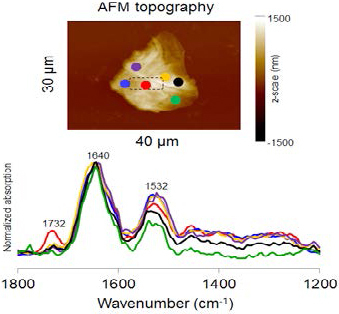 However, stronger absorptions at 1732 cm-1 are detected mostly in the area identified by the AFM-IR spectra (Fig. 1 and 2). There is a sharp drop in the intensity of this carbonyl stretching band outside the 3 μm x 6 μm red spot (Fig. 3). Nevertheless, weaker signals at 1732 cm-1 surrounding this red spot are still seen. This agrees with the results from AFM-IR spectra, and also suggests lipids concentrate into a particular area of this SC specimen. Figure 3. IR images at 1650 and 1732 cm-1 of the same SC shows the distribution of proteins vs. lipids. 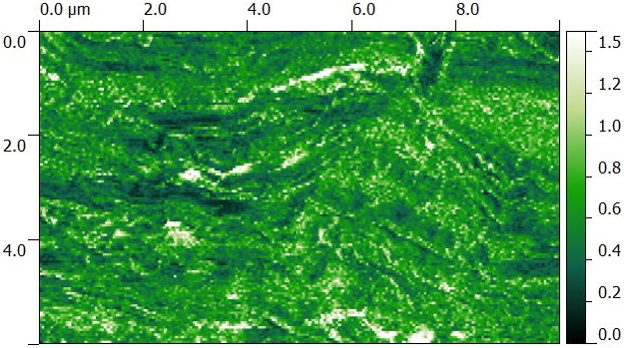 Using the AFM-IR technique, high resolution IR analysis of a human stratum corneum specimen is performed without cryomicrotomy, and unambiguous identification of lipid composition is achieved. Simultaneous collection of topographic and IR images at 1650 and 1732 cm-1, along with localized IR spectra, enables the unparalleled spatial visualization of protein and lipid distribution in SC. This technique can be further expanded to examine the distributions of cosmetics and topical medicines in stratum corneum, as well as their effects on the protein and lipid structure and distribution.